Important Features Include: Computer Programmable!! High Cut Filter (That's works) High Power Final Transistor - The SR-955 uses MOSFET transistors that provides the user with 100 + watts PEP (90 watts SSB). If you want be heard, the SR-955 has the power required to do some serious talking. Multi Colored Display with new designed meter. Change the color of the radio with the NEW multi color 955 radio. (This is cool) Digital Echo with/ Dual Front Mounted Controls - Provides the operator a much wider range of effects and control than typical factory or aftermarket echo boards. Our board is able to reproduce the human voice with virtually no distortion providing maximum clarity and enjoyment. 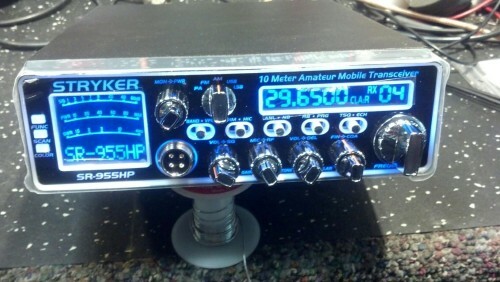 Be sure to check out my review of this radio..
on 12/12/2013 Three Strykers your out!! IT was love at first sight with this radio, I still like it even now however I have owned it less than a year and in this time frame it has been in for servicing twice now. The Companies (STRYKER) communications and customer services skills are something to be desired. Firsts off after only a month the three blue LED’s across the top of LCD meter display burnt out or just stopped working a short while later the green in that same place went out, on top of this the radio did not like a good performance antenna on SSB. I have a Wilson 5k and a SIRIO Performer 5K and both gave great SWR on am and FM however the second I made a sound in the Mic on SSB the SWR shot through the roof maxed out the meter on the radio and on both my externals. At that point I filed for an RA and sent it off. I even emailed them the tracking number. Never got any correspondence at all from them radio just showed up about a month later at my door. Checked tested it and it was working like new again, so I thought. The channel knob would just fall off the radio it was so loose I could turn the radio face down and it falls off. Then I noticed there was NO AUDIO on FM TX, the Dev had been turned all the way down inside the radio, and last but not least the radio progressively got worse with sliding off freq and would happen during TX or RX without warning would not even show on the Freq display but would slide off .5 to 1 full KC and the only way to bring it back was to tune the Fine or Cores clarifier off and back but it was getting harder to do after a month or so. While once again sent it in it was gone about 3 weeks came back with no channel knob at all there for that was never fixed as requested. I’m giving them one last chance to make it right and they are sending a new radio I will return to update if it has any of the same issues or not. I just brought this Radio last week. Yesterday, I tried it out for the 1st time on 38 LSB. Was talking to my local for a radio check when Unit 940 out of California and ok42 from Oklahoma heard me and said the radio was sounding real good and I was doing an S9 and S15. I have an Imax 2000 (Rooftop) and was surprised this radio was getting out like that without an external amp. The receive is beautiful. The built in VFO makes a big difference.